The recruiting industry is not what it used to be. Jobs, technology, candidates, and strategies have all changed immensely over the past few years, as STEM positions proliferate, social media explodes, and a new generation of workers—complete with new habits, wants, and needs—has emerged. You've probably felt the impact of this evolution firsthand, and you've realized that it doesn't matter how many people are actually out there looking for jobs (or not looking for them, as the case might be). If you’re having trouble finding the right candidates for the right positions at the right times, you’re dealing with a talent shortage. 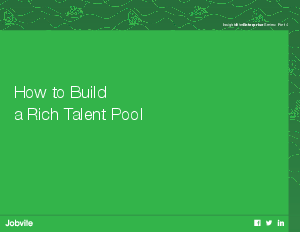 In this eBook, we outline four critical ways you can ensure the development of a rich talent pool.